Some Dental Associations have become concerned that certain Dental 'terminology' may be misleading to the public, giving rise to "unreasonable expectations" in new and evolving dental treatments such as: Dental Implants; same appointment (in-office) all-ceramic crowns and inlays made on E4D Computerized Crown Designing and Milling machines; Cone Beam Computed Tomography (CBCT-Scanner); Implant Computerized Planning software; and Computer Generated Surgical Guides. At the Leigh Smile Center, we don't want our patients and potential patients to be misinformed by the information on our websites ... or any other dental website for that matter. In the spirit of complete transparency, we are always willing to provide you with factual information about all the dental services we perform. 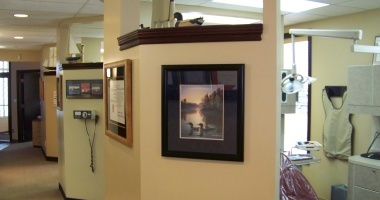 We do not want any of our patients to be misinformed or unsure about ANY dental treatment. 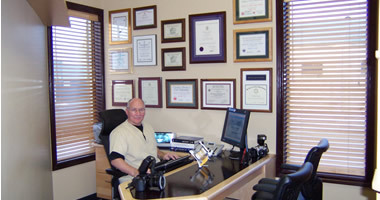 Dr. Leigh has been practicing Dentistry since 1975, and has been performing Dental Implant services throughout his career. 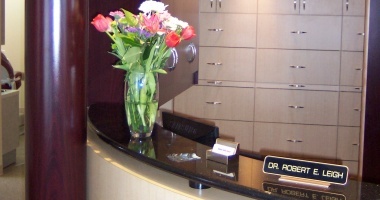 He has built his reputation on open and honest dialogue with his patients, and providing them with the information they need to make informed decisions. 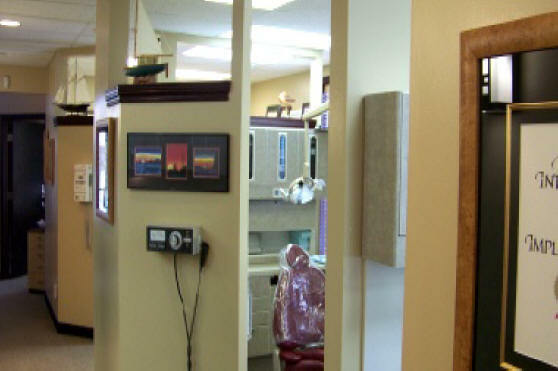 If you have any questions, any questions at all, about any of the dental services that we perform at the Leigh Smile Center, we want you to contact us and become INFORMED patients/consumers. If we don't have the answer to your question(s) immediately, we will do our very best to find the answer for you. If you have any questions about Dental Products, Dental Treatments, Dental Terminology, or Manufacturer Products or Services, we will make every effort to clarify those questions. What PATIENTS NEED TO KNOW about the "TEETH-IN-1-DAY" Concept. "Teeth-In-1-Day" (Implant Direct Trademarked) "Teeth-in-A-Day" (Nobel Biocare Trademarked), and other terms. These phrases, and similar ones, are dental marketing terms that are trademarked by the Dental companies. Obviously, they have to give a 'name' to the service they are marketing, otherwise how would anyone distinguish one type of treatment from another. Teeth-In-1 Day, for example is a registered trademark of Implant Direct Sybron International. Teeth-In-a Day is a registered trademark of Nobel Biocare. These terms refer to specific therapies that are commonly known by Dentists who perform Dental Implant services. If that treatment is the one that you would choose, your Dental professional would/should explain all aspects of that treatment, and get your consent prior to performing the service. As you are aware, the "advertising" of a product or a treatment almost never gives a complete explanation of EVERY minute detail. That would be burdensome and unreasonable, and you probably wouldn't have enough time in a day to review all that information. Can you imagine having to read a textbook in order to be completely informed about a common dental service? That is what you leave to the Dental professional who has been licensed by the Dental Association. Your Dentist, in consultation with you, will suggest the most appropriate treatment for your dental needs, and will explain what you can expect from that treatment. However, if you have concerns about a dental service, or are unsure of what it entails, we will be happy to direct you to research materials, peer-reviewed articles, dental company websites, or dental organizations. The Internet also provides information on thousands of dental websites, dental manufacturers, Dental Implant organizations, and dental associations. No doubt, if you are considering Dental Implants and costs, you have looked at more than one website and found that the terminology is the same or similar, and that the costs may be different. 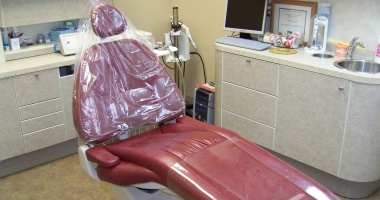 In an effort to "protect the public", Dental Associations may end up 'restricting' dental advertising so much so that the patient or potential patient gets too little information. This would be a disservice to the patient or potential patient. We believe in the intelligence of the public, and their ability to make their own decisions and choices about the advertising they read. "Teeth-In-1-Day" ... what it involves. On rare occasions, we do replace a missing tooth in a single day with dental implants. This is easier if the site is edentulous (no tooth there), and there is an abundance of available bone height and width at that site. If the Implant, when placed, exhibits excellent primary stability then we can immediately place a TEMPORARY Acrylic Crown on the implant . We follow very strict guidelines when doing this and the temporary tooth would have to be taken out of occlusion (the crown height reduced or made ‘Shorter’) so that it doesn’t contact the opposing tooth, and all lateral excursive contacts are also removed (no sideways contacts). There is a ‘Progressive Loading’ concept promoted by Dr. Carl Misch which has had some good success. But, for the most part, these are just ‘Temporary Solutions’ until, at the proper healing time, the Final Crown is placed. This temporary tooth would stay in place for about 5 months in the Upper Arch (Maxilla) and 2 months in the Lower Arch (Mandible). The bone in the lower arch is usually denser than the upper arch. Then the Temporary Crown would be replaced by a Final Definitive Crown (what patients usually refer to as a Permanent Crown). Keep in mind that to fabricate the Final Crown we require either an Impression of the Implant (called a Transfer Impression) or a Scan of the site with the Implant Abutment (post) in position. We can fabricate the Final Crown in one of two ways. Either we can send this information (final impressions or master working models) to one of our Dental Laboratories and have them manufacture the crown, or we can fabricate the crown ourselves 'IN -OFFICE' with our Computerized E4D Crown Designing and Manufacturing Equipment. If we send the information to our Laboratories it takes about 2 weeks before the finished crown is returned. If we make the crown in-office it takes us about 2 hours to complete the process (from the start of the visit to the cementation of the Crown). The Crowns can then be ‘Cemented’ onto the Implant Abutment (our preferred method) or, in some cases, the Crowns can be made to be ‘Screw-Retained’ (we are doing more of these lately). There are Pros & Cons to each technique, which can be explained to you fully by us or your own Dentist. MULTIPLE TEETH REPLACEMENT (IN-A-DAY) ... what it involves. ***** THE FOLLOWING STEPS are used for patients with no teeth, who already wear complete dentures. This treatment is usually called “Teeth-in-1-Day” in Implant Dentistry. That is a fairly recent name given to one particular type of Implant placement utilizing four (4) Implants (“ALL-OVER-4”), two of which are placed in an angled orientation (to avoid either the Maxillary Sinuses or, in the lower arch, the Inferior Alveolar Nerve and Mental Foramen). In other types of Surgery, sometimes 6 or 8 or as many as 10 Implants can be used to replace teeth in a single Arch. Everyone’s mouth is different so there are many different ways to complete the case. The INITIAL Appliance, however, is ONLY a TEMPORARY One (the one you get on the day of surgery). ***** Actually, the PROCESS for ‘Teeth-In-A-Day’ (A Nobel Biocare ‘Slogan’ invented by Prof. Malo of Spain) takes Several Visits (usually 6 to 8). This is the Consultation Visit where we get to know our patient, examine the patient’s mouth, discuss their chief complaint and provide various standard treatment options to hopefully solve their problems and improve the situation to their satisfaction. In order to place the Implants for this type of treatment we require a Computer Generated Surgical Guide (these are made for us by a Scanning Center in the USA). - We place Radiopaque “Markers” on your Complete Denture and then take a CBCT Scan of your Jaws with the Denture in position. - Then we take a Scan of the Denture by itself. - We send these 3D X-Ray Images to Atlanta, Georgia via the internet. 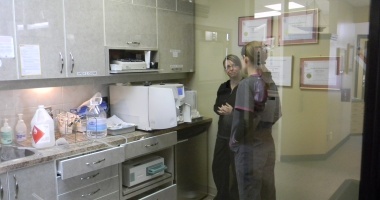 - We then book a “Planning Session” with the Scanning Center in Atlanta to review your case. - We provide a Patient Instruction & Information Folder with all the standard Informed Consent Forms required, and Diet & Home Care suggestions as well as the Prescriptions necessary for the Surgical Treatment. In a few days we go on line with our Technical Representative using Planning Software and decide what type and size of Implants will fit your jaw and in what positions we should place them in the available bone. ***** IN SOME CASES A PATIENT DOESN’T HAVE ENOUGH BONE TO PLACE THE IMPLANTS WITHOUT A BONE GRAFTING TREATMENT BEING PERFORMED FIRST. (We can discuss this with the patient and inform them of the various common treatments available). BONE GRAFTING TAKES 5 TO 6 MONTHS TO HEAL PRIOR TO IMPLANT PLACEMENT. Then the Computer Generated Surgical Guide is fabricated utilizing all the information collected from the CBCT Scans. Surgical Guides are like a Mouth Guard with round metal ‘Sleeves’ at the Implant sites. When the Guide is in the mouth the Implant drills fit into the sleeves at the correct positions for Implant placement. Of course Implants can be, and often are, placed without Surgical Guides (we perform a large number without guides). However, in our Center, experience has taught us that Surgical Guides make the more complicated surgeries easier for us and the patient. - A BONE-SUPPORTED GUIDE (for some of the larger more complex cases). This is the Dental Implant Surgery Visit. We do all our Implant Surgery using Local Anesthetic. The average amount of time for the placement of four (4) Implants is about 40 minutes. If a Tissue-Supported Guide has been used there will be no sutures. If a Bone-Supported Guide has been used or the process was performed “Free-Hand” you will require sutures. We usually like to leave the sutures in place for about 10 to 14 days. 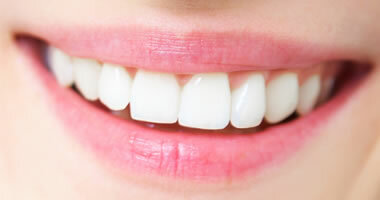 Here is where the “Teeth-in-A Day” or "Teeth-In-1 Day (Misnomers) Concept comes in. - You can just let the surgical site heal for 10 days until we remove the sutures, and wear your original Upper or Lower Denture (as a temporary denture) for the remainder of the Healing Period with Soft Tissue Conditioning Liners in them (we do this for you). REMEMBER: The usual Healing time for Osseointegration (Bone healed around the Implants) is 5 Months in the Upper Jaw and only 2 Months in the Lower Jaw. There is NO Charge for this treatment. - We can retro-fit your existing denture, or a new one, to fit (Screw-Retained) over your new Implants on the same day as the surgery. So you leave the office with “fixed” TEMPORARY TEETH (Made of Acrylic). 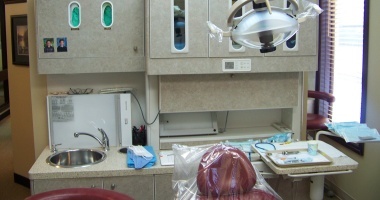 There is a cost to the patient for these “Teeth-in-A-Day”, as they are called in Implant Dentistry. This is NOT the Final Prosthesis. This is the first “Prosthetic Appointment Visit”. We attach Implant “Impression Transfers” to your Implants and take a Final Transfer Impression with an accurate Polyvinylsiloxane material. We then connect the Transfers to the Analogs (Implant Replicas) and seat them back into the Final Impression. Then the Impression is ‘poured-up’ in dental stone with a soft-tissue simulated area around the implants (Like gums). Our Laboratory sends us the ‘VERIFICATION JIG’ which is used to verify that the positions of the implants on the final Master Working Model and in your mouth are Identical. Once the Accurate and PASSIVE fit of the JIG is verified, we take the Bite Registration for the Patient’s Vertical Dimension. Then our Laboratory fabricates a Wax Set-Up of the Upper or Lower Denture or both. 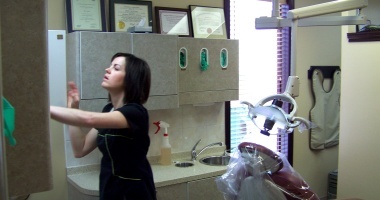 The Denture Wax Set-Up is tried in the patient’s mouth. Any necessary adjustments are made to the look and occlusion of the denture. This Wax Set-up along with the Master working Model are sent to a Laboratory for the Fabrication of the TITANIUM Framework. The Final “ALL-OVER-4” Appliance (What is known as a “HYBRID Appliance”) is attached to the Implants in the patient’s mouth. This Appliance is a ‘Screw-Retained’ (Fixed/ Removable Type of Implant Appliance). It is solidly fixated in the patient’s mouth and there should be no movement. (It can however be removed by the Dentist or his/her staff for maintenance at any time.) The fit and occlusion are checked. A Final Digital Panorex X-Ray is taken to check the frame fit. Final Photos are taken. Instructions are given. 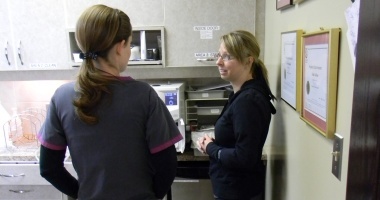 Home Care & Hygiene Instructions can be given by our Hygienists. ***** SO I THINK YOU CAN SEE THAT THE FINAL DEFINITIVE APPLIANCE TAKES A LOT MORE THAN ONE DAY. On the other hand, however, it is possible for you to leave the office on the Surgery Day with stable Temporary Teeth in your mouth. 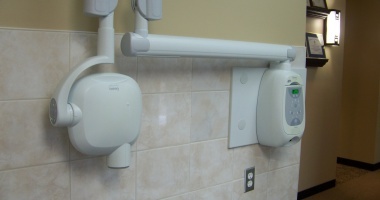 Patients may prefer this so that they are not without teeth until the final appliance is placed.